Dan Raviv is an American journalist and the Washington DC correspondent for i24 News TV. Previously he was with CBS News as their national correspondent and was heard regularly on the CBS Radio Network. He is best known for his expertise on American and Israeli politics, as well as the greater Middle East. However, he is always plugged in and kept abreast of current situations from all corners of the world. Gail Davis: You've probably seen and heard Dan Raviv over the years as he's covered the world's biggest events on CBS. There's no question his biggest day was 9/11. But he's had a long career of good news [00:01:00] and bad news. Along the way, Dan has also written five books, including a best seller about Israel's security called "Every Spy a Prince". He's also written a book explaining US Israeli relations and even a book about the Marvel comic books company and how it came back from bankruptcy. 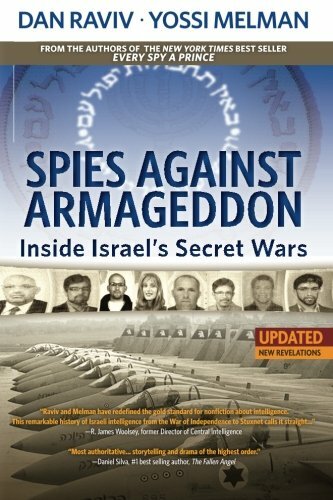 Dan's book is "Spies Against Armageddon", which is his new history of the clever and secret ways that Israel protects itself. Dan's a graduate of Harvard. After living in [00:01:30] New York City, Tel Aviv, London, and Miami, he is now the Washington correspondent for a global TV news service called i24. I know Dan always has something fresh and new to say, so please join us in welcoming Dan Raviv to today's episode of GDA Podcast. Dan Raviv: Wow. Hey, that's so nice. Hi, Gail. Hi, Kyle. Hi there. Gail Davis: I was reflecting as I was preparing for this today that we all met each other in 2012 on a cruise from New Zealand [00:02:00] to Australia. And one of the things I remember about you, Dan, 'cause I really hone in on who's speaking on the cruise ship, is how many different times you spoke on how many different topics. So I know we have a lot of great ground to cover today. Dan Raviv: Well, I remember that, too. And just thinking that we're at that time on a cruise ship at the bottom of the world, as some people call it, and so you're far from every crisis on earth [00:02:30] yet the beautiful thing about cruise ships, they actually want speakers to sort of plug you in. What's happening to the stock market, what's happening with the president, what's happening with Russia, and so I love it. I love the mix. You're out there in the middle of nowhere but you're in touch with the world. That's absolutely me. So happy to do it on the podcast, too. Gail Davis: It would've been after. Kyle Davis: It would've been after? Gail Davis: It would've been right after. Kyle Davis: [00:03:00] Oh, yeah, I remember that. Dan Raviv: [inaudible 00:03:01] late that year, mm-hmm (affirmative). Gail Davis: So I know, Dan, that you had a very distinguished career with CBS and you left that career, I think it might've been close to 40 years, and went with a startup. Talk to us about that. That's a big shift. Dan Raviv: Well, I'm gonna pat myself on the head and say it's courageous, certainly, my wife thinks so but she was encouraging, which is great. Get out of the old rut, do things in a new way. [00:03:30] And when you join a startup like i24 News, it means that it doesn't yet have all the rules. How long should a report be, even how should you hold your head, this way or that? Do you have to wear a tie in every report? I'll whisper, we don't have to. So, I love that getting away from the old rules. But almost everything at CBS News after being in bureaus all around the world had been kind of been there, done that, let's see what a new outfit does but here's the real thing about i24 News, it's anchored 20 [00:04:00] hours a day out of Tel Aviv, Israel. And I over the years have built up Israel as a specialty and four hours a night, it's anchored from Times Square, New York City. So, I focus very much as the Washington correspondent on the evening hours. Like Americans talking to America. And we're on some cable systems and getting bigger and bigger as a startup should and we're available online and an i24 News app and people even watch us all around the world. But just to think that [00:04:30] it was gonna be linking Israel, the country that as I say, I've written books about, and the US and very interesting managers and they were very smart and, I don't know, I guess I was just ready to do something new. No regrets, this is where I've been since the middle of February 2017. And I'm telling you, it's going okay and we're growing every week. Gail Davis: Well, certainly there's never a slow day in the city in which you live. What would you say your primary focus is on a daily [00:05:00] basis? Gail Davis: I thought that might be the answer. Dan Raviv: Yeah, and more particularly, Gail and Kyle, it's interpreting Donald Trump to the world and I really try to do it in a non-partisan way. That's just my nature, if you believe in astrological signs, I'm Libra, I'm a balanced person and I am by nature. And even as much as people say, "This presidency is incredibly different." He is a non-politician. And so of course my liberal friends say, "This presidency is outrageous and horrible." And my conservative friends, [00:05:30] a lot of them are also wondering to tell you the truth but they do think that Trump is on their side so they're basically happy. I like to see it straight down the middle and interpreting means that if we have a president who Tweets as much as he does. If we have a president who then sometimes gives a formal speech but he'll ad lib a couple of extra lines that turn out to be the most controversial things he's said, the things that he says off the top of his head, I think someone needs to be fair and just try to explain [00:06:00] why did he say that? Where is his heart? Where is his mind leading him? What does he really care about? An example is the so-called travel ban. I think sincerely he thinks there's a danger to the United States from unchecked immigration and certainly, liberal groups say, "But there haven't been any attacks from that group at all. It's ridiculous, why block folks from those particular six countries?" But I think the Trump administration in its policies has some sincere points it's trying to make, has some things it's trying [00:06:30] to accomplish, certainly the methodology has been unprecedented and his critics would say, "Un-presidential." And does he know how to get along with Congress? No. But Republicans in Congress say, "Well, that's because he's new and he'll get better at it." I don't know. But that's what's fascinating, watching and seeing if he gets better at it and will our country get better for it. So those are all open questions and whenever I talk about it on TV or I write a column, also, for the newspaper Newsday twice a month, [00:07:00] or to audiences in person, I try to be down the middle. I think it's the best way to offer information and then you decide if you agree or don't agree with the policies that I'm explaining. I try to explain things so they'll get into your head and I think there's important stuff going on, it's not all fun and games and Tweets. Kyle Davis: So, in case people were wondering, we're recording this on July 5th and since everything Trump is on a daily basis, we may be missing some stuff that happens [00:07:30] in the future between now and when we publish this. So in like the last few days, we've had this Mika Brzezinski thing and then now he's Tweeting about China as he's going to Poland to go spend 50 hours there pre-NATO summit and then he has this meeting coming up with Putin. How do you explain all of these little intricate things that something as seemingly weird to talk about [00:08:00] a newscaster to something as Tweeting about Chinese policy with North Korea and then some reports saying he's ill-prepared for this upcoming meeting with Putin, how do you explain this to the world? Dan Raviv: Yeah, that's a whole basket of stuff and it's not too much that you're asking, Kyle, because I think I love to find connections and may I include that China's not the only country that does a lot of trade with North Korea, but Russia could have a hand, also, in helping things simmer down in North Korea. And by the way, how the United States [00:08:30] is doing when challenged by North Korea and its missile launches and its nuclear program affects whether the world will pay attention to us anywhere else. On trade deals, in Europe, on trying to find a solution for the Syrian civil war where just part of it is the fact that ISIS is in Syria, and ISIS of course threatens to attack in the United States. I'm just sort of drawing the connections here and if you have to sort of deliver an organized speech 20, 30, [00:09:00] 40 minutes, I find that by mentioning things that the audience, and this is true on television too, mentioning things that the audience does know. Okay, Vladimir Putin, they've heard of him, all right, North Korea, we've heard of the dictator there. But drawing a connection between those things, including trade and then on the side I can mention that Trump really courted controversy by totally canceling a trade deal called the Trans-Pacific Partnership, which not many Americans [00:09:30] hear about 'cause we don't talk about foreign affairs that much. But to the Pacific countries like South Korea and Vietnam and the Philippines, the US dropping out of that left them in a lurch. They wonder where is the leadership? And Trump is trying to rush ahead and be a leader in a different way, making one-on-one deals. Those are just examples. So when Trump goes to, say, the Group of 20 Summit, as you say, early July in Hamburg, Germany, a lot of it is what people in Washington call optics. [00:10:00] How does it look? What can get done at a G20 Summit? It's like you almost have too many leaders there. Sure, Trump and Putin, their meeting is gonna be a big deal because it's the first ever but beyond that, all those other leaders, the final communique, all the subjects. Will Trump look presidential? Will Trump Tweet? Will Trump engage in various distractions like fighting Mika Brzezinski or CNN in a wrestling ring? Now, those are all questions that are connected to whether America looks strong and in the end [00:10:30] that absolutely impacts whether we can have our way against terrorist groups, in trade deals, exporting US products, which leads to more jobs for Americans. I think it's all connected. And lastly, if the president's doing well, there's a much better chance of him getting the main points of his agenda passed by Congress. As of late June, there'd been a series of embarrassments, including that the health reform hadn't gone through. So, all these [00:11:00] things are connected whether Trump looks like a winner, it affects whether America looks like a winner. Kyle Davis: So you mentioned that i24, your new company or outfit that you're working with, is anchored in Israel so I'm assuming it's also based in Israel, what's the sentiment or the feelings in the first six months or so of the Trump administration in Israel? Dan Raviv: Well, you may recall that Barack Obama didn't get along well with the prime minister of Israel, Benjamin Netanyahu, it was a personality [00:11:30] clash, it was a politics clash. The feeling in Israel was that Barack Obama was trying to lecture the Israelis, they have to pull out of the territories they captured in the Six Day War 50 years ago, otherwise Israel can't be a democratic Jewish state. And Israelis said, "Stop lecturing us, we're having a hard enough time fighting terrorists and doing what we can." And I would say most Israelis got resentful of Obama, certainly Netanyahu government did, so Trump gets elected, not Hillary [00:12:00] Clinton. And by the way, Israelis felt that Hillary would've kept lecturing them. And again, in my non-partisan way I'm saying I don't know if for good or for ill, maybe Israel needs to be lectured in order to be pushed into peaces talks but the way the Israelis feel is, "Stop lecturing us." So, Donald Trump gets elected, his first visit abroad in May is to Saudi Arabia and then Israel. Now the Israelis felt a little bit [inaudible 00:12:26], "Why Saudi Arabia first? But all right, that's cool." They got it that Trump's [00:12:30] tried to encourage the Saudis to be nicer to Israel, maybe together have a counter-terrorism and anti-Iran block. And the Israelis say, "Okay, we kind of like Trump's ideas but wait a second, Trump said he was gonna move the US Embassy from Tel Aviv to Jerusalem to honor Israel and its capitol Jerusalem. But now he decided not to, at least for now. And Trump is talking about forcing us into peace talks with the Palestinians where we'd have to give up some territory and maybe not build settlements in the West Bank. [00:13:00] Wow, we thought Trump is totally pro-Israel." So Israelis, they have their big question mark right now. They judge American leaders by the level of support. They didn't like Obama, they think they like Trump but the question mark is up there right now. And I would say that's Israel's take on what America's trying to do right now. Kyle Davis: The one followup thing that was kind of left out of that that I'm thinking of, too, is that in that meeting that followed the maybe unintentional leak [00:13:30] of classified information with regards to sources and methods using an Israeli contact and ISIS, so I was wondering if that had any impact on Israel and the Israeli government's views towards Trump as well? 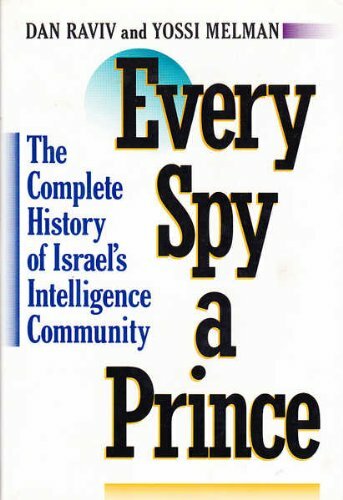 Dan Raviv: Yes, it did in the government and I've written a couple of books on Israel's intelligence agencies, including "Every Spy a Prince", and the current "Spies Against Armageddon" so I do keep up with this. I have an Israeli co-author on books like that so I believe that I'm aware of what Israelis feel about things like leaks [00:14:00] and they hate them. And they really were concerned when Donald Trump in a private meeting with the Russian foreign minister and the Russian ambassador in Washington. They got together in the Oval Office and we only had Russian photos of that event and they were backslapping and happy and smiley and then we find out from the Russians that Trump told them some information that US intelligence had gotten about what ISIS was doing in Syria, building small bombs that could go on airliners. And then we find out that the information came from Israeli [00:14:30] intelligence. So yeah, Israel's concerned and therefore in the Mossad, they said, "We have to be more careful what we tell the CIA because Trump's new to this game." And so they're trying to think favorably of Trump but, yes, they were worried but, believe me, it's in the nature of intelligence agencies not to like leaks whether they come from presidents or newspapers. They don't like leaks. Kyle Davis: Maybe I guess my followup question is you kind of, I said this followup question thing twice but you mentioned something [00:15:00] it's like they have to careful in what they tell the Trump administration 'cause they just don't ... Obviously, Israel doesn't have a handler to say, "Hey, Mr. Trump you can't say this," so instead it's redaction through omission and so I'm just kind of curious as to how long that will persist or how long can ... What is essentially the best relationship we have in the Middle-east if not the greater [inaudible 00:15:26] region, how does that work? Dan Raviv: Very good. So let's consider [00:15:30] it this way and, again, if anyone ever wants to hear a talk that's specifically about the Mossad and the CIA and the history of how Israel and the US got along, it's always a bit of a roller coaster, nobody trusts anybody 100%. And Israel is a small country, population eight million. It has its own priorities, it's very concerned about Iran and its nuclear program and Iran's support of terrorism. More concerned than even is the US. Israel's concerned about its own borders, Israel has its own view about [00:16:00] the Palestinian issue, and so Israelis assume that they've got to worry about themselves above all. They're lucky and they've worked at it to create the United States as their greatest friend and Israeli leaders like to say, "Israel has no better friend than America and America has no better friend than Israel." Okay, true, but there's even a case of espionage by the Israelis in Washington. A lot of Americans remember the Jonathan Pollard affair, an American who happened to be a Jew who worked for an American [00:16:30] Naval intelligence agency and he was spying for Israel, feeding them documents. Israel apologized, swears it won't do it again and they probably won't. But it does show that there's always a little bit of suspicion. In the espionage game, nobody trusts anybody 100%. But still, you use your friends, your connections, your liaison relationships in order to help yourself. And so even the CIA doesn't trust anybody 100%. But it's a tough game, intelligence. The Israelis [00:17:00] play it better than most, especially considering what a small country they are. It's a fascinating history but let's not kid ourselves that these two countries, US and Israel, trust each other 100%. Kyle Davis: So, kind of pivoting to the greater Middle-east, I know that we talked offline or prior to recording kind of what's going on with ISIS in Syria and Iraq and its different ... Well, we didn't talk about the franchises but we can talk about that as well. So I believe Mosul just fell, [00:17:30] so what else is going on and how are things changing and what is the greater issue at hand? Dan Raviv: Well, as you said, Kyle and Gail, depending when folks are listening to this podcast, I'm not gonna promise that ISIS is totally, totally finished in the two major cities that it was holding for about three years, Raqqa in Syria and Mosul in Iraq. But once the US really got going, first under President Obama and then I think even more so this year under Trump, the US military [00:18:00] is really delivering a lot of help to local forces. To the Iraqi army and Kurdish forces to get ISIS out of Mosul and to the Syrian Democratic Forces, which includes Kurds, again, in Syria and you have US airstrikes, you have US advisors, because ISIS is our enemy. Okay, so once you defeat ISIS in cities, where do you think they go? They're not all dead. There are going to be insurgents, they are going to be terrorists, [00:18:30] certainly in those two countries, Iraq and Syria. Many of them will go back to their original countries and that could be North Africa and other places where they came from, attracted by this great struggle. But even more worryingly, some of them, and generally will be Muslims attracted by joining ISIS, will find their way back to countries in Europe, including Britain and France and Belgium and the Netherlands and Spain and Italy and the authorities in those countries are absolutely on the lookout for anybody [00:19:00] coming back. And they usually try to hide their travels. They'll come through Turkey and pretend they went on vacation or they had a job on a Greek island but they really went to Syria and became fighters and some of them real trained terrorist. And already we've some attacks in Europe, as you know. US officials are very concerned, as well, although they don't believe that more than 200 Americans went to join ISIS. We're very lucky over here. We're far, far, far away from Syria and Iraq. In general, Muslim populations [00:19:30] in the US are not that radicalized, there are a lot of people who work in Islamic community centers and mosques who are in good contact with the FBI who absolutely give information and tips when there's some extremest around. In Europe, I wish I could say the same. Radicals and extremists definitely exist and have staged attacks. That would be the next stage, I think ISIS still has its ideology, still wants to spread the notion of an Islamic caliphate that will perfect living [00:20:00] under strict Islam and they will try to destabilize as many governments as they can in the Middle-east and in Europe. So I'm afraid ISIS won't be finished and we have to absolutely strengthen our defenses and awareness and in President Trump's case, he believed that it therefore required the travel ban and being unbelievably more careful with immigrants. That's where you go into a huge controversy because America's a nation built on immigration, so how do you find the balance [00:20:30] that will keep us safe? Kyle Davis: So, when the power vacuum occurs that ISIS is pushed out and whatever remaining fragments of fighters go back to their parts of Europe or elsewhere, who fills that void? We have the PKK or the Kurds coming in, you have the Iraqi government, you then have the Syrian government, you have Al-Nusra, you have so-and-so backed by Iran, and then the Russians, who's filling this void? 'Cause I just see it saying, okay, we're all unified against this [00:21:00] and then once ISIS is out, okay, now it's a mad-dash for power. Dan Raviv: Well, Kyle, two different sets of issues when we talk about Iraq and Syria. Iraq does have a government, it's capitol is Baghdad. You know, of course, what the United States did, went in 2003, helped topple Saddam Hussein, eventually after a lot of fighting and violence, a new, apparently stable government has arisen. It gets a lot of support from [00:21:30] Iran, which is not in America's interest, so there's a power struggle going on in Baghdad. Who will influence Iraq more? The Iranians or western countries? For now, it was in our interest to make sure that ISIS is dealt a defeat by getting them out of Mosul and so the US will want to still look active in helping the Iraqi government. Also, that part of northwestern Iraq that the Kurds have an autonomous legion with the capitol of Erbil, it's technically in Iraq [00:22:00] but the US has a close contact there. There's oil that's produced, there's other industry, we want peace in that part of the region so that terrorists can't have a haven. Meanwhile, just to the west in Syria, they've had a civil war since early 2011. So, I don't think the US has any vision or plan for who should run Syria. I'll even say that the Trump administration would be willing to let Russia's Vladimir Putin have his way, that whoever runs Syria [00:22:30] is going to be a friend of Russia so that the Russian Navy can still have its Mediterranean fleet using a warm water port in Syria and that's Russia's strategic goal. And the US can live with it, we just don't want terrorists to be in Syria with training camps, plotting attacks on airliners and on the United States. What's gonna happen in Syria? How quickly will the civil war really end? I certainly don't know [00:23:00] but I could tell you Israel watches it really carefully with great concern that Iran and its Hezbollah partners, Iran really pays for Hezbollah based in Lebanon, so very concerned Israel is. The US, actually less concerned, like I said, they would let Syria be in Russia's sphere of influence, just get the terrorist ISIS out of there. So quite different, our American goal is quite different in Syria. Kyle Davis: Well, that's I guess a fair response. Gail Davis: I'm super [00:23:30] curious about your background and why all of this world news has had such a pull on you? Oh, and a lot of cousins. Yeah, cousins [00:24:30] and uncles would visit from so many countries. Now, you've heard the phrase "the wandering Jew" and you don't have to push it too hard but of course Jewish people, until the establishment of Israel, usually did have to move every generation here, there, or somewhere. And so in my family, just the cousins who would come through where my parents settled in Great Neck, Long Island, New York, those cousins would speak Hebrew, Russian, Yiddish, Spanish, French. Oh, that's for sure. Maybe even a couple [00:25:00] others, as well. And they had all lived in all those countries, etc. And then we would visit them, etc. So, we got to be very world-minded and I think early on from our home and from our family, we knew that much as America is fantastic and a shelter and a haven to us all and of course a big melting pot, America isn't it. You do have to understand what's going on in the rest of the world and so I don't know, that's been my thing even as I became a journalist. I can write stories about anything. I can cover Trump and the economy, [00:25:30] I can moderate a forum on business trends or why the stock market is up or down or whatever, where interest rates are headed, I'm interested in all that. But you give me something that's connected to world affairs, I don't know, it just comes to me naturally. This is the set of topics that I really love. Gail Davis: It's interesting, sometimes I'll have a conversation with a client about a particular speaker and they'll say, "They're just not global enough." And then one day later, I'll be talking about another [00:26:00] speaker and they'll say, "They're too global." Is there such a thing? Can you give a domestic talk and not talk about the world? Dan Raviv: I think it would be a mistake. I think it would be a mistake, especially that I mentioned that our chances of success lie largely in how the US is doing in terms of trade, and having military allies overseas, and having, well, just having successes. And that leads to our having more jobs because we export [00:26:30] more products that the world will buy and it's not all business, it's also kind of the feeling. Are we popular in the world or not? Is there good will toward Americans? Because even as we take vacations and trips or our children do a junior year abroad or a vacation or a destination wedding, you want to have the sense that America is still popular and respected. But it really does affect our economy and so, sure, like I said, I can give a presentation that's basically on how some industry is doing [00:27:00] or moderate a panel of experts. But I would say inevitably, something that that industry tried to do overseas, some product that the industry wanted to sell overseas but a German company was doing it better or a Vietnamese company was doing it more cheaply, those are all things that affect us. India's a giant country. If they're going to be as good as we are at technology but they are going to charge a lot less for their products, that's gonna [00:27:30] be a tough one for us and certainly anyone in American business has to find a way of coping with those challenges. Gail Davis: So, your background with your family and your news career make sense out of most of your topics and most of your books, the one that just jumps out that I'm not sure how to connect is the one on Marvel comics. Now I've had the pleasure of being in your home and I know you love Marvel comics but why don't you share with the listeners how you got interested in that and a little [00:28:00] bit behind that book? Dan Raviv: And it's not from childhood, by the way, if anyone's listening and remembers how it works with comic books, you're either are into DC Comics, Superman, Batman, Justice League of America, and Wonder Woman, or Marvel, which is Spider-man, the X-men, and the Avengers. Okay, yeah ... Here I am dropping names, [inaudible 00:28:19]. Anyway, what happened is someone approached me after I'd written that, lucky me, that successful book on Israeli intelligence agencies, someone approached me and said, "You really should look into the bankruptcy [00:28:30] of Marvel Comics." And I said, "Why would I do that?" And my informant said, "The two guys who swooped down into bankruptcy court and rescued Marvel and then turned it into a movie company are both immigrants from Israel. They're both Israeli-Americans and they used an Israeli style of determination and innovation and if one approach didn't work then they would try another approach to the bankruptcy court or to the lenders and the creditors and all that stuff you have to do in bankruptcy." And, boy, did I learn a ton doing that book. [00:29:00] So I still had my doubts but when I met everyone involved and learned that Ike Perlmutter and Avi Arad, the two heroes of the story, the two winners who turned around Marvel, and got it away from two of Americas most famous billionaires, Ronald Perelman and Carl Icahn. They were the losers in the Marvel battle. I felt that I could explain the business and the bankruptcy court through colorful characters who curse at each other and work all night and yell at each other [00:29:30] and come up with innovative solutions and even the two Israeli-Americans who won the Marvel battle even issues statements, "Like all Israelis, we're not giving into terrorism." And they were referring to Carl Icahn. So, just the nature of the battle in the end won me over. And so, yeah, I wrote that book myself, a solo book. I learned so much. I spent about a year and a half doing it. 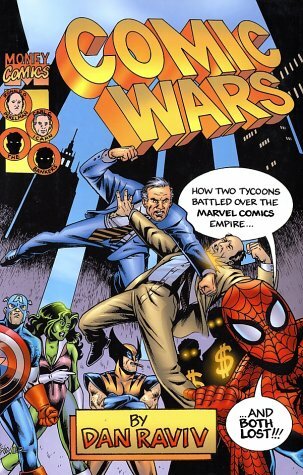 It's called "Comic Wars" and it was a good time. A good time was had by all. Kyle Davis: If I've learned anything living in New York and having a few friends [00:30:00] that were in the IDF, never mess with a guy named Avi. Dan Raviv: There you go. I'm with you. Kyle Davis: So, one of the things, though, that we kind of skipped over and I just want to circle back on before we wrap this up, what's the landscape kind of coming forward? I know some of the bullet points here that we were gonna mention is we're talking about are these tax cuts coming, is the healthcare bill coming, what's going on with North Korea, there's just a million and one different things so [00:30:30] there you go? Dan Raviv: Yeah, it's a tough job. It's a tough job. Well, I don't mean as a journalist and a lecturer, believe me, I can take it, but to be a member of Congress or a Senator, then recommending listening to your constituents, do they really want that health reform or not, etc, wow. You get pressure from the White House, okay. And the toughest job of all is being president. Do you remember at one point after he had the job for about three months, Trump said, "It's harder [00:31:00] than I expected. I had a good life before and I thought that was hard, being in business. This is harder than I thought." Okay, so even he discovered so many conflicting interests. How do you find allies for the United States around the world? What do you do when Americans die? Whether it's that unfortunate student, Otto Warmbier, who returned to the US from North Korean captivity in a coma and then died. Do you accuse North Korea of murder [00:31:30] and then have to do something about it? Or what if you're the president and you decided to okay a Special Forces raid on Al Qaeda or ISIS and some of the soldiers or civilians die, just how awful do you feel assuming you're a human being and you have feelings? And there are the political realities, as well. And, in the case of Donald Trump, you promised voters that you would repeal and replace Obamacare. And you said during the campaign, "It'll be so fast and so easy and it'll be great healthcare at a fraction [00:32:00] of the cost." And all of those are more or less quotes. And then you find reality once you have the job and you ask your Republicans in Congress what's doable and then you find they won't unite. I don't know, again, as of our taping date right now, what will get passed or not. A lot of people think that tax reform will be easier because people love lower taxes but I think if his proposal is one that helps rich people a lot more, [00:32:30] then there's gonna be a lot of resistance and that even the Republicans in the senate won't be enough to get through the tax reform the way Trump envisions it. How about infrastructure? Building? Spending a few trillion dollars in the next 10 years to build things? That's gotta be popular but that's where you'll find Republicans saying, "Whoa, whoa, we don't want to increase the deficit. We can't have more spending if we can't pay for it and there's no way we're raising taxes, we're here to lower taxes." Wow, all these goals conflict. [00:33:00] And so a lot of it, heading toward the midterm elections already in sight, late 2018, and then of course Donald Trump swears that at age 74, he intends to get reelected in 2020. He swears that's a big goal, he almost takes it for granted that he will get reelected. He's got to look great. He's got to look popular and he's got to look like he got a goodly number of his promises accomplished. How will that happen? That is why I am still in journalism. There is [00:33:30] so much to follow and it's, wow, I'm wondering, you're wondering, and it affects us all. Dan Raviv: Now, Kyle, I hate to cut you off but when it comes to the cabinet, that shouldn't happen. They're all chosen by Donald Trump, that shouldn't happen. It has happened because there hasn't always been a clear lead from the White House and often what the president Tweets [00:34:30] seems to contradict what he says in public or the White House claims are the positions. And so that's difficult and maybe things will settle down. When it comes to members of Congress, well, listen, every president's had to face that depending how large or small your party's majority might be. But it's a matter of coalition building and here's one question for you. Almost everyone remembers that after Barack Obama became president in 2009, that's when he took over in early 2009, there were Republican leaders on the hill, on Capitol [00:35:00] Hill, who said, "Our main thing is to make sure he fails." And some people say because they were racist, I actually don't buy that. They thought, of course, he's a socialist, liberal Democrat and we want to make him fail so we win the White House next time. But they really spent a lot of energy trying to make him fail. Now, let's update it to this year. Are there many Democrats and liberals who above all want Donald Trump to fail? Now, they would cite a reason. They think he's uniquely dangerous or stupid or whatever it is they [00:35:30] say and so they think for the sake of the country, they have to make Donald Trump fail. Well, I am down the middle enough to say, we don't want the president and the White House and administrations to fail. We want them to adjust and build coalitions and become leaders who can get things done in a complicated and challenging world. Kyle Davis: Yeah, and I think that's what kind of I think most people want and I think where I was kind of getting at with all these different things is just like someone hand him a book from [00:36:00] Doris Kearns Goodwin, "Team of Rivals", and then something on coalition building and "How to Win Friends and Influence People", maybe put down "The Art of the Deal", and let's get some stuff done. Dan Raviv: Well, okay, and I don't want to make fun. I don't want to make fun and I'm not, I try not to ridicule the president but it is known that he is not a book reader, that the reports that he gets are very, very short. It is said, not 100% confirmed, that if anyone from the State Department or even his daily presidential briefing wants to get his [00:36:30] attention, you have to have the name Trump in the report as much as possible because then he'll pay attention because he cares very much on what people and the world think of him. All right, if that's what motivates him, then let's live with it. But I just come back to it and I would any time I speak to an audience, as well, I think despite us being divided into right and left, self-described conservatives, liberals, Fox-watchers versus MSNSBC-watchers, whatever it is, we've got enough [00:37:00] in common, including the fact that the world's complicated, and that if we don't move ahead in our education and counter-terrorism and being more productive in what it is that we manufacture so that we can sell it abroad, if we don't move ahead, we're going to lose out to world competition. And that's going to affect our lifestyle and our prosperity. So here's my call, please, for a way to find unity in all this. Kyle Davis: Well, that, my friend, is a good place for us to wrap. [00:37:30] So, on July 5th, the day following the United States of America's birthday, a call for unity from Dan Raviv. I like it. Gail Davis: I love that. A call for unity. Kyle Davis: Awesome. Look, if you guys want to book Dan Raviv to have him come enlighten your audience, you can do so by contacting GDA Speakers at 214-420-1999 or by going to gdaspeakers.com. For the transcript or ability to find the books and everything else, you can go to gdapodcast.com [00:38:00] for more information there. With that being said, Dan, thank you. Gail Davis: Thank you, Dan. Dan Raviv: You guys are great, thanks a lot.